Like previous years, Pharma Maac, with its premium brand Wellion, will take part in marking of World Diabetes Day. 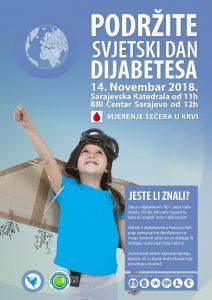 In cooperation with Diabetic Association of Children and Youth of Sarajevo Canton, on November 14th, we will conduct free counseling and blood sugar measurement, at the city square in Sarajevo. Focus at this event will be on the most deprived part of the diabetic population – children. We hope that our participation will contribute to our younger fellow citizens living with their illness more easily and safely.